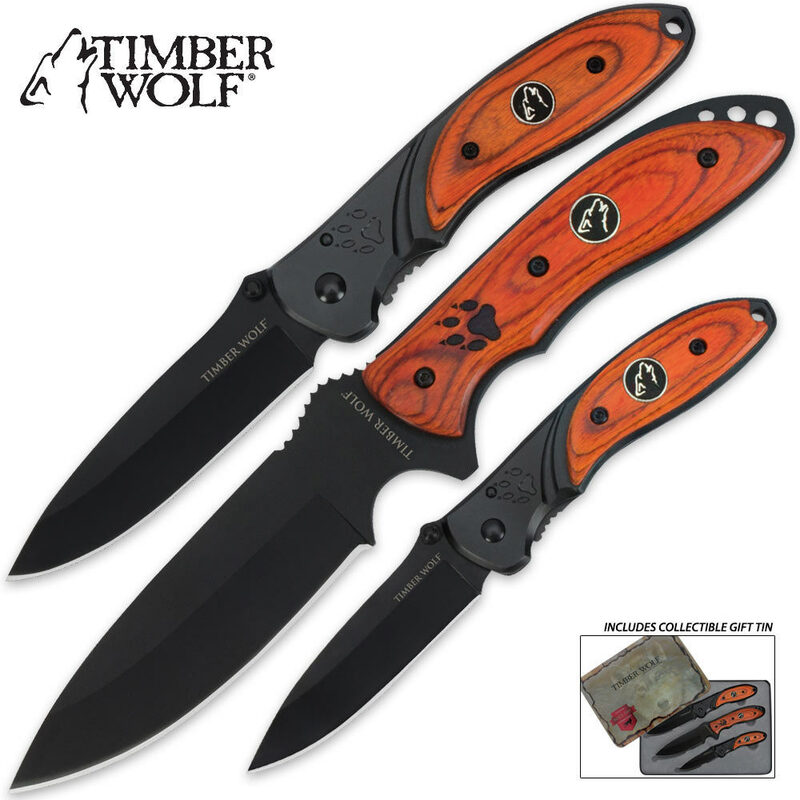 Timber Wolf Black Paw 3 Piece Knife Set with Tin | BUDK.com - Knives & Swords At The Lowest Prices! 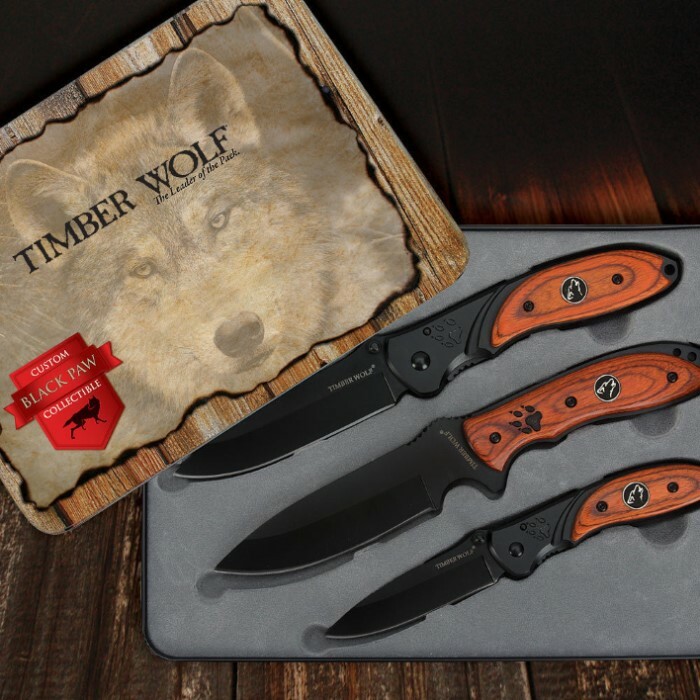 You can lead the pack with this three-piece knife set, exclusively from Timber Wolf. It includes a large lockback folder, small lockback folder, and fixed-blade knife. Would have been a nice set for the price but one knife was missing a screw and another knife's wood was lose. I had to super glue them on. Save your money. Great looking set!Keep one with me all the time. I got two sets of these a few weeks ago. One for me one for my Dad. They are really well made and my Dad fell in love with the little folder instantly. They are very sharp and so far seem to hold a good edge for the price level. Just wish the straight blade had a catalog number for a sheath. The set looks even better than the photo. 1) Wood handles VERY nice, like a nicely finished gunstock, frankly I was shocked at how good they look. 2) Love the Timber Wolf logo, black screws, black paw imprint in the handles (I have dogs, love the brand for the unique knives they design, so it's fun for me) 3) Wood handles are thicker in your hand than they look in the photo, great combo of wood over metal with nice detailing. 4) Build quality on my set is outstanding, blades tight open or closed. Great gift set for anyone, and the Tin is cool as well, the folders you can pocket, and if you get a light sheath for the fixed blade, it'd be perfect for a kid hang off their belt. Teach kid how to properly sharpen knives using this set, big smiles and gets 'em off the 'pooter' for a bit. Cheers all, and thanks Kennesaw. P.S. - On a BOGO you'd be nuts not to get this. The blades are the only things I have a complaint about, they were shipped very dull. Other than that, very nice looking knives and they seem well built. Great knife set. Came in a tin for storage. Set looks great. Twice the bargain as they were a bogo. Gave set to my brother and he was thrilled with them. Knives were sharp. Would make perfect gifts. Would recommend to anyone. Great for the price of this knife set. The timber wolf emblem fell out of the large folder when I took it out of the metal case. No big deal, a couple drops of lock-tight and problem solved. I have two sets and may order several more for gifts. I sharpened all the knives and they will shave hair off my arm. Will be interesting to see if all the knives will hold an edge and remain sharp. All in all, this was a great deal. Handles not tightened....very hard to close...too heavy! Great price for this set. Gave one to my Dad,one to my Son,and one for myself.